Speaking at the NAPCP Annual Conference is a professional development opportunity for those working in the Commercial Card and Payments industry. 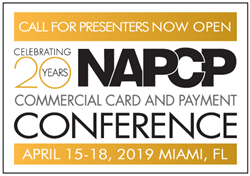 The NAPCP, a Commercial Card and Payments professional association, has announced its conference call for presenters for the 20th Annual Commercial Card and Payment Conference, April 15-18, 2019 at the InterContinental Miami in Miami, Florida. The organization is looking for experts, practitioners and thought leaders who can share case studies, successes and thought-provoking ideas, with an eye for trends, innovation, and continuously improving card and payment programs across sectors. More than six hundred Commercial Card and Payment professionals will gather for four days of educational sessions, informative exhibits and demos, and networking opportunities. The deadline to submit a proposal submission form for the conference is October 1. Early-bird registration for the 2019 NAPCP Commercial Card and Payment Conference begins October 2, 2018. For more information on the conference, including exhibit, demonstration and sponsorship opportunities, visit napcp.org/2019. The NAPCP is a membership-based professional association committed to advancing Commercial Card and Payment professionals and industry practices worldwide. Serving a community of more than 20,000, the NAPCP is a respected voice in the industry and an impartial resource for members at all experience levels in the public and private sectors. The NAPCP provides unmatched opportunities for continuing education and peer networking through its conferences, Regional Forums, webinars, website, virtual demonstrations, newsletters and regular communication. The association sponsors research and publishes timely and relevant white papers, survey results and other documents. The NAPCP also offers a Certified Purchasing Card Professional (CPCP) credential.